Manufacturer: South Bay Technology, Inc. The polishing of semiconductor materials often requires the use of harsh chemicals such as bromine or hydroflouric acid solutions that would corrode the stainless steel from which most of the SBT fixtures are constructed. A special fixture for satisfying this requirement has been developed. 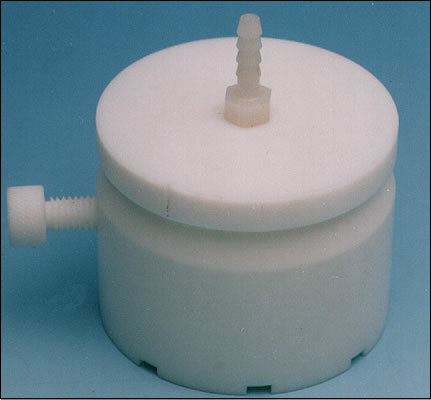 The Model 160 is made of Teflon® and is designed to hold crystal wafers up to 2 1/8" diameter while they are being polished with very corrosive chemicals. The sample is held in place by vacuum and the sample is polished by rubbing the exposed sample against a suitable polishing cloth soaked with the chemical solution. The Model 160 is ideal for damage free polishing of semiconductor materials with harsh chemicals and has been used extensively for polishing GaAs with bromine-methanol solutions.